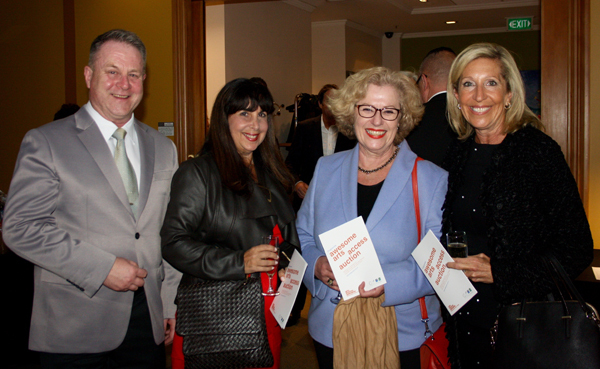 An awesome, stylish and entertaining networking reception and charity auction was enjoyed by 135 guests at the third Awesome Arts Access Auction, held at CQ Hotels Wellington on Wednesday, 30 September. With amazing donations such as a night at The Huka Lodge with a car for the weekend from Gazley Motors and tickets to the opening of the New Zealand Festival the event and dinner for eight in your home by caterers Simply Food - stunning bidding options allowed guests to support Arts Access Aotearoa’s efforts to increase access to the arts. 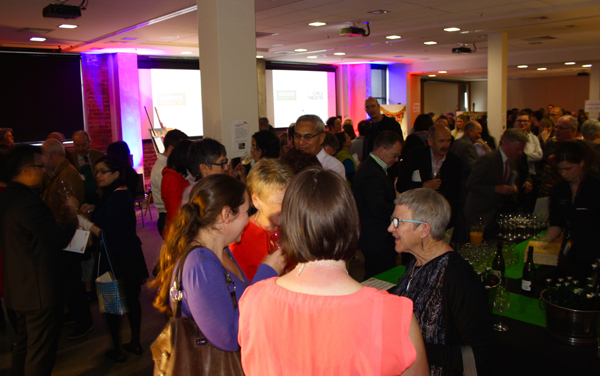 “Arts Access Aotearoa works with producers and museums such as Chamber Music New Zealand, Circa Theatre, the New Zealand Festival and Te Papa and we appreciate their support with tickets to live events,” said Richard Benge Executive Director. “These are just some of the arts leaders providing accessible and inclusive programmes for disabled audiences and we value their support very much,” he explained to the guests. Olivier explained how the hotel has a New Zealand Sign Language menu and that CQ is the natural home for accessible and inclusive events. The guests loved the live jazz performed by Rodger Fox and members of the Wellington Jazz Orchestra and were delighted by highly persuasive auctioneer Peter Wedde of Peter Wedde Antiques. The next opportunity to support the fund raising efforts of Arts Access Aotearoa will be on a night at the movies on 25 November at Penthouse Cinema. Please contact info@artsaccess.org.nz for tickets and details of the screening. 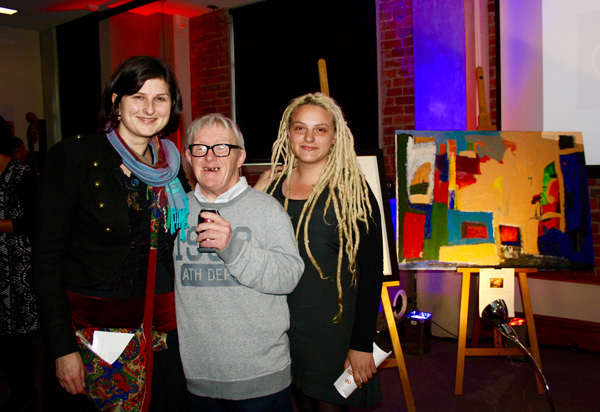 If you were unable to attend the Awesome Arts Access Auction please make a donation to support Arts Access Aotearoa. The following people, businesses and organisations made the Awesome Arts Access auction a great success. Thank you to auctioneer, Peter Wedde of Peter Wedde Antiques in Kelburn, Rodger Fox for providing jazz entertainment, Streamliner for audio visual services, Graphic Solutions for design services, Out of the Box for printing services, Lion Nathan for beverages, Bidvest and Wild Chef for providing food, Smartpay for eftpos, Gordon Harris for providing easels and Eliecer Reverol - photographer. Thanks to CQ Hotels Wellington and major item sponsors. Huka Lodge; Gazley Motors; Simply Food; TSB Showplace; Nice Hotel; Weta Workshop; Te Papa Tongarewa; Zealandia; New Zealand Festival; Isaac Theatre Royal; Flowers Manuela; Fraser Hoffe; Daniel Phillips; Robert Rapson. And thanks to donors of the live and silent auction items. Alpha Art Studio, Amora Hotel, Bay Plaza Hotel, Bill Allan, Brentwood Hotel, Calcifer glass art, Chamber Music New Zealand, Cin Cin, Circa Theatre and Encore Restaurant, Chris Brown, Christina van der Hooft, Commonsense Organics, Daniel Phillips, Emporio, Exodus, Fleur Wickes, Fraser Hoffe, Gecko Press, Geoffrey Gaskell, Gerard Coe, Gill Ross, Govett Brewster Art Gallery/Len Lye Centre, InterContinental Wellington, Isaac Theatre, James Cook Grand Chancellor, James Toki, Joy Cowley, Les Mills Extreme, LOT EIGHT, Michael Cupples, Mix, Museums Wellington, Nikau Café, Pacifica Arts Centre, Pablos Art Studio, Prefab, Pony Lane, Reece Tong, Robert Rapson, Roxy Cinema, Schoc chocolates, Spark Centre, Te Papa Tongarewa, Te Papa Press, Tim Badrick, Unichem Cuba Mall Pharmacy, Vincents Art Workshop, West Plaza Hotel. Original generation time 1.4740 seconds. Cache Loaded in: 0.0271 seconds.